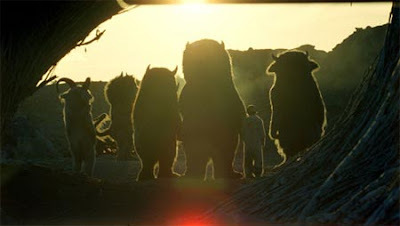 We speculated last week about how we would feel after we saw Where the Wild Things Are. So now that we've gone to the movie and contemplated it over the weekend like the sophisticated intellectuals that we are, what do we think? Well, we thought it was awesome. It's unlike any kiddie flick we've seen in a while because it's less about embracing one's wild imagination and more a melancholy meditation on sadness, depression, loneliness, impermanence, and death. Yup, these Wild Things are beyond neurotic—they need to be heavily medicated. I've read some reviews and other articles that claim that this is a children's movie for adults, as if to warn parents that they should keep their sons and daughters far away. But David Eggers and Spike Jonze's beautiful adaptation (from the super famous Maurice Sendak picture book) has a child's logic to it, and I think kids would get it on a level that adults don't expect them to. I mean, sure, don't bring your three-year-old, but I'm pretty sure that school-age children would dig it. I'm curious to know if I'm right. I know I have some mother readers—what did your kids think? How young are they? Did they love it? Or did they have to cry themselves to sleep?